Nutrition is a battle that isn’t easy to fight for yourself, let alone for your kids. When you live in an era of convenience and everything is engineered, grown, picked, processed, packaged, and shipped to a store near you, it can be nearly impossible to know what you’re getting in your food as well as make the right choices for yourself and your children. As you walk down the aisles at grocery stores, it’s tempting to pick up whatever product looks good at the moment. If the packaging and marketing are good, the food might lead you to believe things about it that aren’t necessarily true. 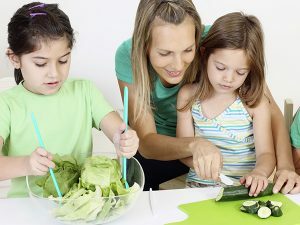 To implement good nutrition for your children from a young age, know the sources of the food products you’re consuming. Support companies that aim to give you and your family quality, organic nutrition. If you know you can trust a brand, you will feel safe buying their product and it will all get easier as your knowledge increases. Because of the genetic engineering of crops, it’s impossible to get the amount of vitamins and minerals from your food as you would have gotten a hundred years ago. You have to eat way more of a vegetable today to get the same number of nutrients as you would have from one head of broccoli or another produce product. This means that to keep your kid’s bodies up to par, you’ll have to find nutrient dense supplements to give them instead. Think of incorporating some sort of greens product into your daily diet and see how it positively impacts you and your family. So many people have a tendency to reward themselves with food or something sweet, so if you want your child to grow up with good nutrition and not having a dependency on foods that are not great for them, raise up your child to not associate food or sugar with good behavior. If you do something else for your child every time they do well, they’ll be less likely to reward themselves with unhealthy things as they grow up and they’ll be much healthier because of it.